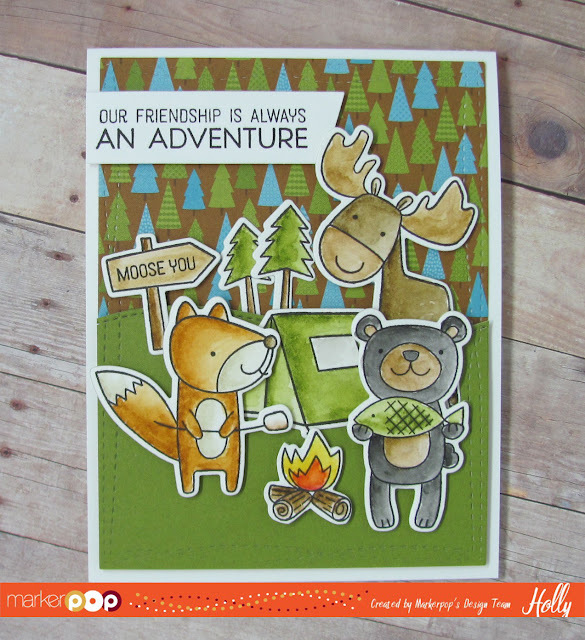 Hollybeary Creations : Moose You!! Hello everyone.. I hope you are having a Great week so far. 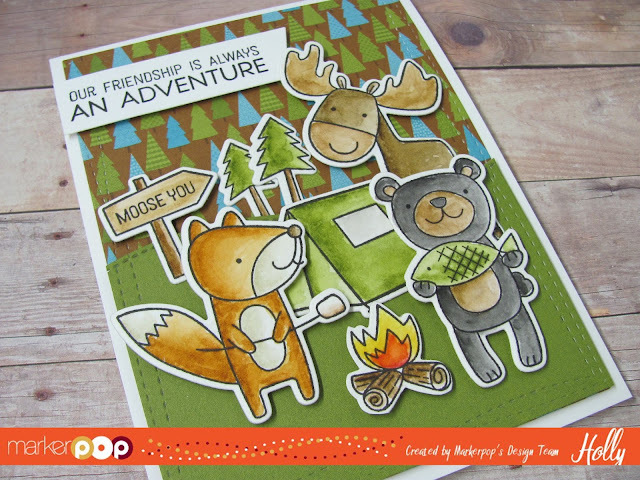 Today I’m sharing a Cute card featuring lots of fun critters from the My Favorite Things Warm & Fuzzy Friends set on the MarkerPop Blog. Each image was stamped onto some watercolor paper with some VersaFine ink. Then I colored each image in with Distress Markers and a water brush for a watercolored look. I used the following Distress markers on the images: Gathered Twigs, Vintage Photo, Ground Espresso, Tea Dye, Rusty Hinge, Pumice Stone, Hickory Smoke, Old Paper, Peeled Paint, Festive Berries, Carved Pumpkin, Black Soot & Mustard Seed. After the images were dry I cut them out using the coordinating dies and my Big Shot. I created the background by die cutting two pieces of patter papers from the Doodlebug Happy Camper 6×6 pad using the MFT Wonky Stitched Rectangles and Stitched Snow Drifts die-namics. I adhered the background to a top folding A2 size White card base using some foam tape for the grass area. Then I added each image with some foam tape as well. I stamped the sentiment from the same set onto a piece of White card stock using VersaFine ink and die cut it with a banner from the MFT Blueprints 27 die-namics. This is the last week to join our Watercolor Giveaway.. Head over to this blog post for all the details on how to enter.